After three intensive days of presentations and cooperation with their #HackTheCamp mentors, ten teams of programmers, refugees, designers, social entrepreneurs, humanitarian workers, educators, and artists competed with their proposals during the final phase of the hackathon creative marathon to find sustainable, scalable solutions for refugee issues in Greece. How can we improve living conditions for refugees? How can they access reliable information on their legal status? What kind of opportunities are available or can be created for refugees? How can we tap into the many skills that moving populations bring with them? How can populations in transit and local populations come closer and develop an intercultural dialogue? These are some of the challenges that Hack the Camp (#HackTheCamp) attempted to address. In the first phase of Hack the Camp, which took place October 21-22 at Diplareios School, Athens, more than 70 participants and 30 experts from the fields of education, technology, culture, and humanitarian aid became a dynamic team that worked collaboratively to address the needs of refugees and migrants during this crisis. The contribution of refugees and migrants to offer their skills and experience was significant. 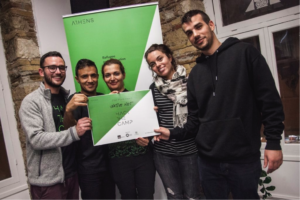 The final Hack the Camp was held on December 2-4, 2016 and was organized by Impact Hub Athens, the Onassis Cultural Center and the U.S. Embassy in Athens in collaboration with two international organisations with extensive experience in organising humanitarian hackathons: Creative Associates from the U.S. and International Alert from Great Britain. Team “NativeNet” won the first prize and $10,000 by presenting a smart mobile application that brings together all services available for refugees in Arabic, Farsi, and English. It also includes basic Greek lessons and enables refugees to show off their skills and get in touch with NGOs and other potential employers. Second prize and $6,000 was awarded to Team “Refergon”, which proposed an easier way for refugees to access the labor market through existing social networks by developing a chatbot. At the same time, in cooperation with NGOs and academic institutions, Refergon will offer training for refugees to acquire business skills. Refugee participants contributed as members of the NativeNet and Refergon teams. The “Autonomous Water Supply” team focused on the issue of hygiene, winning third place and $4,000. The team cleverly designed a portable, collapsable sink that improves refugees’ access to clean water, especially vulnerable groups such as women and unaccompanied minors. Special mention was given to the “EterART” team who proposed a performing arts project for children from different cultures, using their own bodies as percussion instruments. 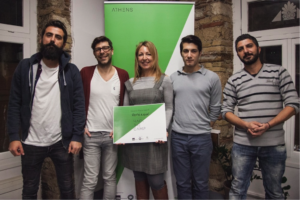 The winning teams will receive mentoring and business incubation support from Impact Hub Athens for the next four months. They also have the option of joining the Microsoft BizSpark program, which provides access to innovative software development tools. The cash prizes and additional services are designed to help the teams put their winning ideas into practice to benefit refugees. 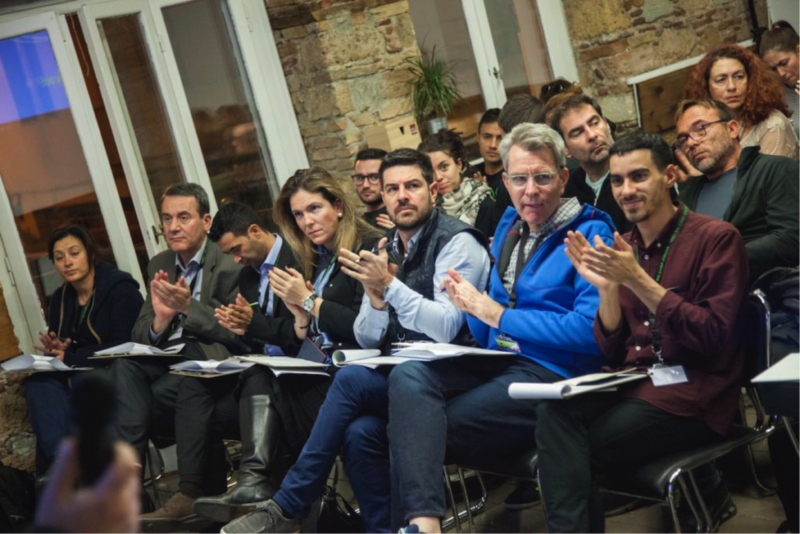 Microsoft actively supported this initiative by furnishing prize money, offering technological and business mentoring groups, and providing software, which contributed to the successful implementation of the Hack the Camp ideas. Intel also provided free technological equipment for participants that will develop hardware solutions. Free localisation services for participants courtesy of Transifex. Two international organisations with long experience in humanitarian-related hackathons will act as consultants, facilitators and moderators at the events. Creative Associates from the U.S. and International Alert from the UK will be the main facilitators of Hack the Camp. 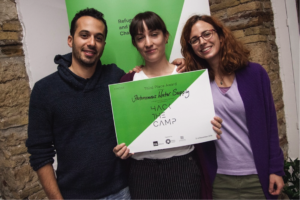 Microsoft actively supports Hack the Camp by contributing to the monetary prizes, offering technological and entrepreneurial mentoring services to the teams, as well as software and devices, helping towards the success of the initiative. GFOSS – Open Technologies Alliance within the context of the ongoing collaboration with the Onassis Cultural Center in Athens, actively supports Hack the Camp with demonstrations of open hardware and software while partners of the Open Technologies Alliance will participate in both stages of Hack the Camp and support the participating teams in using collaborative design and programming tools, as well as enable them to share their creations on open collaborative platforms. Congratulations to the winning teams of the hackathon: NativeNet, Refergon and Autonomous Water supply! Make sure to also check the Facebook Group and #HackTheCamp on Twitter for the latest news and updates!